In a standard real estate buy, which Realtors refer to as a contract for deed, you shop for a home, find one you like, make an offer on it, make an up-front down payment, assume a mortgage and take ownership of the home. 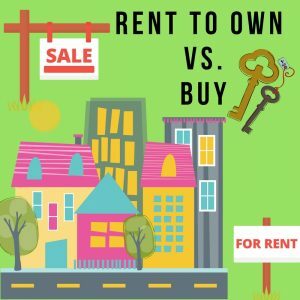 A rent-to-own arrangement works in much the same way, but you don’t take out a mortgage or assume ownership of the property until some time in the future. Instead, the initial agreement includes lease and option agreements that specify a rental period and outline the date by which you must obtain a mortgage and formally purchase the property. During the rental period, the seller serves as your landlord. Depending on your mortgage company, the amount of your down payment in a buy agreement is likely between three and 20 percent of the property’s purchase price. Banks typically require that you draw down payment funds from your own account, though some may allow you to borrow your down payment or take out a second mortgage. In a rent-to-own agreement, you typically do not need a down payment to begin the rent-to-own agreement. Instead, sellers commonly require a rental deposit and a separate up-front cost known as an “option fee.” Rent-to-own agreements typically allow you to rent the property for a number of years, then obtain a mortgage to complete the purchase. Depending on the specifics of your rent-to-own agreement, the seller may set aside a portion of your rent payment to help with the down payment and closing costs required for the mortgage. When you buy a home, you become responsible for maintenance on the property as soon as the transaction closes. In a rent-to-own arrangement, the seller retains ownership of the property during the rent-to-own period. Since you rent the property from the seller during this period, the seller is typically responsible for maintenance and major repairs that become necessary before you purchase the home. When you purchase a home through a rent-to-own program, you can expect somewhat higher monthly payments while renting the property than you would have if you simply rented the home without a rent-to-own agreement. When you buy a home, your monthly mortgage payment likely includes the principal amount, interest, taxes and insurance. When you rent to own, the monthly payments you make to the seller need to cover any existing mortgage payment plus any amount the seller agrees to set aside as down payment assistance. Your monthly payment likely also includes a profit for the seller.